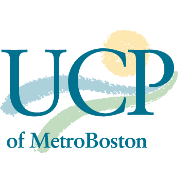 United Cerebral Palsy Association of MetroBoston is a nonprofit, tax-exempt organization founded in 1950. It serves greater Boston, and is an affiliate of the National UCP. It is not supported by the United Way. UCP is a well managed, fiscally sound association with a volunteer Board of Directors composed of individuals with disabilities, and business and professional leaders. UCP has experienced and trained professional staff, and a headquarters in Watertown, MA. Its mission is to advance the independence, productivity and full citizenship of persons with disabilities. Financial support comes from the community and is channeled back into the community. Funds are be raised from contributions, grants, and special events. Funds are also obtained from competitive contracts with the Commonwealth of Massachusetts. Membership fees sent to the National Organization to fund research are mostly returned to the Boston area as grants to major hospitals and medical centers. Serves areas east of Worcester. Children & adults with physical disabilities and their families with a member having a disability. Criteria may differ for different services. Other Information: office and programs are fully accessible.